Every race begins with the "Metro Huddle!" January 2nd 2017 - Just blowing away the cobwebs! Some of our Junior members at Falkirk XC 2017. Metro were founded in 1990 and in the first year the membership was 34, now we have a membership of around 10 times that. Over the years Metro has been at the forefront of road running, cross country and hill racing with a few members dabbling in track running, all over Scotland and abroad. Many of our members wear the vest with pride and fly the flag for the club in far flung corners of the world. 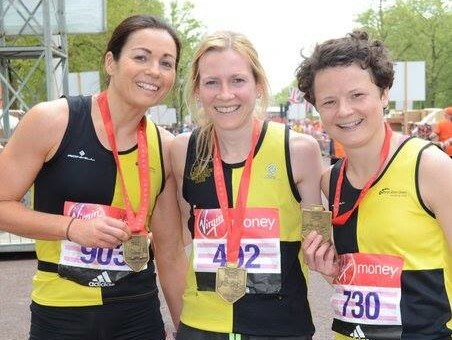 Metro members Fiona Brian, Jennifer Elvin and Hazel Wyness bring home the gold at the London Marathon 2017. No one need feel intimidated, all ages and all standards of runners are welcome and encouraged at Metro. All the forms you need from membership, event entry forms to club standards and claim forms. Spotlighting some of our most inspiring members that have turned adversity into triumph. Metro members Fiona Brian, Jennifer Elvin and Hazel Wyness bring home the gold with a trio of sub-3hr PBs in what British Athletics described as ‘a superb achievement’.